Some of you may be wondering, "Isn't Preston tired from doing writing? He finished his first one review just recently, and now he has this article ready to roll, AND he has another one lined up already..." (Yes, we work hard here at APH Networks eh.) Well, let me quickly relieve you of your concerns. I must admit, going through the International Baccalaureate program back in high school was much tougher, haha. With that aside, let's get down our first order of business. As I mentioned in my Choiix Power Fort review, I also received one of Cooler Master's top-of-the-line power supplies for this week's report. This PSU leans towards performance enthusiasts who look for greater power output, carrying a price tag of about $230 at press time. People like myself would get one of these beasts only to play Counter Strike and own those haxors with aim-bots, using my pure human skills on my high end gaming machine, lol. Cooler Master's Silent Pro Gold sets higher standards of excellence with their patented technologies such as what they refer to as Heat Transfer Technology (HTT), Hyper Path, and Hybrid Transformers (Fuel efficient Optimus Prime, is that you?). With these technologies, Cooler Master promises a power supply that not only brings home the gold medal, but also does so in such a stealthy fashion -- in a way that your Counter Strike enemies won't even know what hit them on your next round. 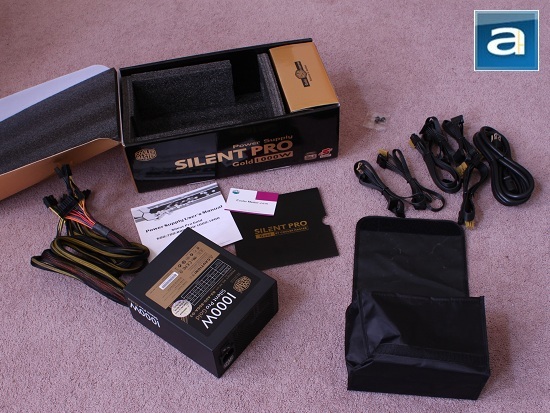 Pushing to the limits, Cooler Master "masters" the Silent Pro Gold with the 800W, 900W, 1000W, and 1200W editions to their lineup of power supplies. Here at APH Networks, we are pleased to get our hands on the 1000W edition today and crack it open for the purpose of evaluation. Read on to see what we have discovered! As I said before, the Silent Pro Gold 1000W came with our Choiix Power Fort portable charger which I have reviewed a couple weeks ago, so I borrowed the same packaging picture from that review. 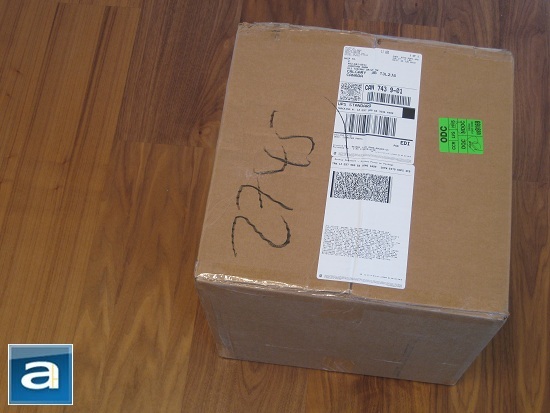 Our Cooler Master Silent Pro Gold 1000W power supply unit was shipped in a cardboard box from the company's offices at California, USA, using UPS Standard to our Calgary, Alberta, Canada location. Surprisingly to me, the cardboard box itself suffered next to no damage as compared to other personal products that I have received from UPS Standard. 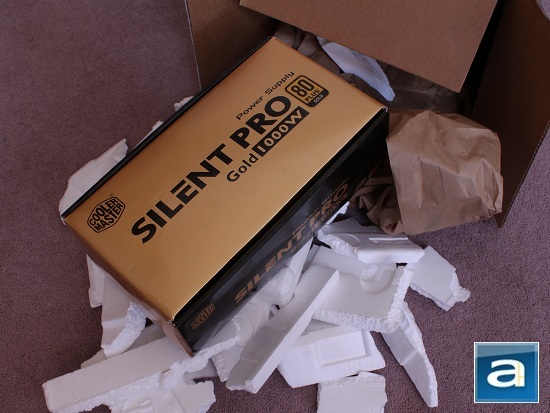 The retail package of the Cooler Master Silent Pro Gold 1000W was packed with large pieces of Styrofoam and brown packing paper. This was to ensure that it would be safe and sound with absolutely no bumps and bruises upon arrival while traveling with UPS up north. As we can see here, Cooler Master has made the design of the retail packaging plain and simple, using gold and black as its most prominent color scheme. Why bother with extensive complexity when the real deal is inside the box? The 'Silent Pro' text is printed proudly large across the middle with the specific model name directly under it -- in our case, "Gold 1000W". Also shown is its 80 Plus Gold certification boldly on the far right side. It should be clear where Cooler Master got the name of this power supply from. Meanwhile, all its features and specifications are shown on the backside of the box. o Heat Transfer Technology™: A unique "L-shaped" heat-sink to remove heat from the PSU. o Hybrid Transformer™: Unique design that combines heat-sink with transformer. o Hyper Path™: Places IC close to transformers leading to huge efficiency ratings. • Flat modularized cables provide easy cable management leads to better airflow. 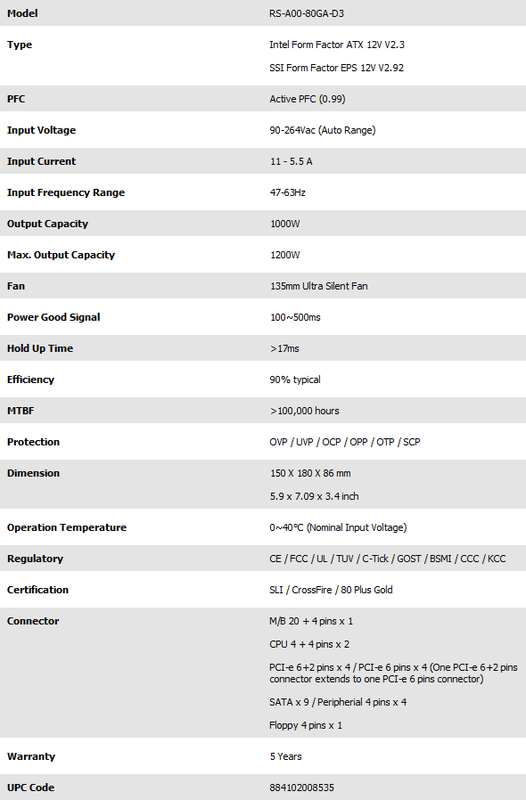 • Compliance with the latest Intel standard ATX 12V V2.3. • Operation with intelligent fan speed control. • High reliability (MTBF> 100,000 hours). • Double Layer EMI Filter retrains noise and to avoid affect to users. • Integrating Active PFC with PWN combo controller while increase efficiency. • Multiple protection design (OVP/UVP/OPP/OTP/SCP/OCP). • Single +12V rail up to 98A. Obviously, Cooler Master likes to provide its enthusiast customer with a plethora of connectors, in order to accommodate those with a serious amount of hardware in their system configuration.